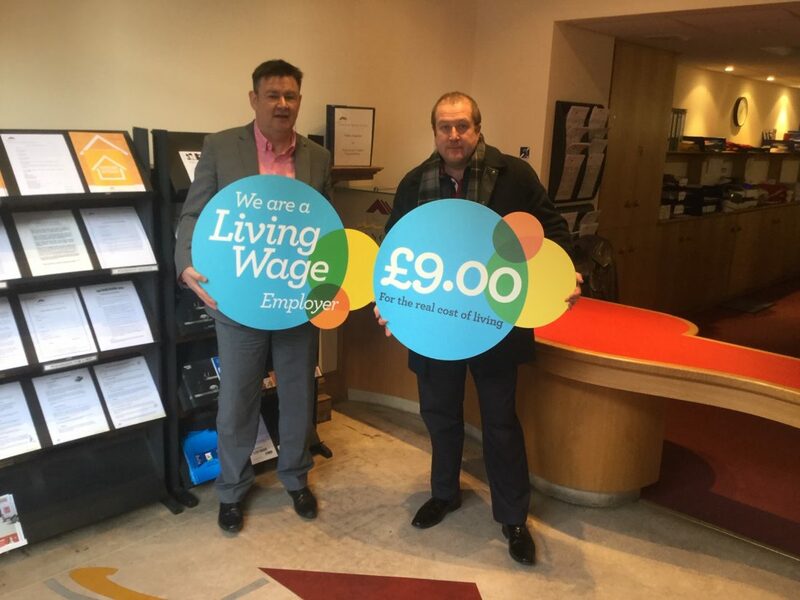 The fifth to the tenth of November marked this year’s Living Wage Week. I was pleased to mark the week by meeting up with Bruce Forbes, the Director of Angus Housing Association. I as an employer and Angus Housing Association are both accredited living wage employers. This is the real living wage as calculated annually by the Resolution Foundation and overseen by the Living Wage Commission. The real living wage rates -there is a separate one for London- are based on what people need to get by. This year it has been set at £9 per hour for those working outside London. The ‘national living wage’ as set by the UK Government is not calculated according to what employees and their families need to live. Another key difference is that the real living wage does not discriminate against those aged under 25 as the the minimum wage does. And why should employers pay the living wage? Research conducted on accredited employers who have introduced the living wage shows that they have experienced a 25% fall in absenteeism; eighty per cent of employers believe that the living wage has enhanced the quality of the work of their staff; and sixty-six per cent of employers reported a significant impact on recruitment and retention within their organisation. And research on employees found that seventy-five per cent of employees reported increases in work quality as a result of receiving the living wage and half of employees felt that the Living Wage had made them more willing to implement changes in their working practices; enabled them to require fewer concessions to effect change; and made them more likely to adopt changes more quickly. So not only does paying the living wage have benefits for employees but the research is clear, it is good for employers. And why is accreditation encouraged? It makes a commitment to employees (or potential employees) but also says to customers and other organisations you interact with that you value your staff and take steps to be a good employer. The Living Wage is important and I would encourage employers in Angus South to get accredited.